Hailed by critics and fans alike as the 'Guitar Event Of The Year,' the multi-artist celebration known as the Experience Hendrix Tour is set to return in 2016. These special concert performances present legendary artists who join together to pay homage to Jimi Hendrix. This next edition of the Experience Hendrix Tour will encompass twenty seven performances this coming February and March, stopping in more than two dozen cities along the east coast, midwest and southern states. Now in its second decade, the tour celebrates the musical genius of Jimi Hendrix by bringing together a diverse array of extraordinary musicians, ranging from blues legend Buddy Guy to Black Label Society and former Ozzy Osbourne guitarist Zakk Wylde, as well as Jonny Lang, Kenny Wayne Shepherd, Eric Johnson, Dweezil Zappa and many others. Billy Cox, bassist for both the Jimi Hendrix Experience and Band of Gypsys, anchors a rhythm section that provides the foundation for exciting renditions of such signature Hendrix favorites as "Purple Haze" and "Voodoo Child (Slight Return)". Jimi Hendrix was a pioneer in both rock and blues, and expanded the possibilities of what could be achieved with the electric guitar, forever altering the course of music history. Likewise, the Experience Hendrix Tour is developing a rich history of its own. By 2004, the first Experience Hendrix Tour came to fruition with a three-date string of shows on the west coast, starting in Hendrix's hometown of Seattle. By 2008, the Experience Hendrix Tour had become a full-fledged, coast-to-coast expedition that continues to date, without showing any signs of slowing down Audiences are presented the opportunity to see great artists paying homage to Hendrix and collaborating with each other in ways they'd never do in their own live shows. "It is such an honor to be asked back for another run," says blues/gospel/rock guitar prodigy Jonny Lang, who has played every tour since 2008. "The music of Jimi Hendrix speaks to each of us in indelible ways. It's another chance to celebrate his legacy." Multiple Grammy-winner and 2015 Kennedy Center honoree Buddy Guy, who was both an inspiration to as well as a personal friend of Jimi's, is also ecstatic to partake in his sixth Experience Hendrix Tour. The stance he takes is akin to that of a missionary: "Jimi Hendrix was one of the greatest guitar players ever and we all need to keep his music alive." "It's an honor to celebrate Jimi Hendrix's legacy and greatness with so many other amazing players, who have become great friends and family to me," echoes Zakk Wylde. "His influence and inspiration will forever be undeniable!" Platinum-selling solo artist Kenny Wayne Shepherd has been on every Experience Hendrix Tour since the beginning. "As far back as I can remember, I've been listening to Jimi Hendrix," said Shepherd. "He has had an enormous influence on me as both a guitar player and a songwriter. He was always trying new things and pushing musical boundaries, which enabled and encouraged me to push the boundaries in my music. The Experience Hendrix Tour is an amazing tribute to the greatest guitar player of all time, featuring some of the greatest musicians in the world today." Dweezil Zappa returns for his third Experience Hendrix Tour. "I've always been a great admirer of Jimi Hendrix," he details. "My dad told me some great stories about playing with him. Jimi's ability to express himself so completely with an electric guitar is very inspiring to me. There was an authentic expression of his personality in the music. And that rings true to every generation. He wasn't following trends. His playing was soulful and exciting and surprising." 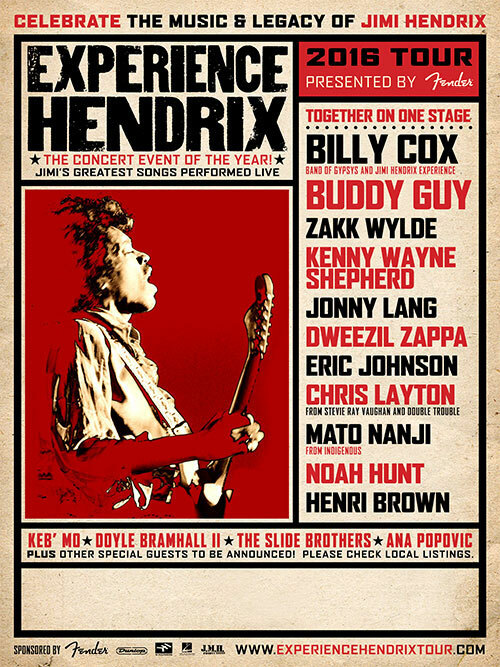 The 2016 Experience Hendrix Tour also includes guitarist Mato Nanji of Indigenous, vocalists Henri Brown and Noah Hunt, and drummer Chris Layton, who was recently inducted into the Rock and Roll Hall of Fame as a member of Stevie Ray Vaughan and Double Trouble. Additionally, special guests will include the likes of Keb' Mo', Doyle Bramhall II, Ana Popovic and the Slide Brothers. More special guests will be announced in the coming weeks. Please check jimihendrix.com and local listings for announcements. Marshall Amplifiers and Dunlop Manufacturing, whose gear is an integral part of the tour's backline, also sponsor the Experience Hendrix Tour together with Axe Heaven, IK Multimedia, Hal Leonard and Alaska Airlines. Profoundly popular with fans and critics alike, an earlier edition of the Experience Hendrix Tour inspired Doug Walters of the Charleston City Paper to rave, "It was an inspired night of great energy and incredible playing. Nothing but good vibes filled the Performing Arts Center. Jimi's spirit and music could not have been honored more." Robert Kinsler of the Orange County Register, called the Experience Hendrix Tour "a steller event," as well as "a special night, and a fitting tribute to a music legend, to be sure." Jackie Braje of Creative Loafing Tampa wrote, "All epic performances aside, the one truly admirable thing about this show is that it never once let us forget who the real star performer is."